Some of you may know that I was recently given notice of my laid off due to a corporate re-org. Luckily, I've had a few good leads and will hopefully start working soon after my last day at my current job. But, needless to say, I find myself with more time on my hands than usual. I've been trying to make the most of it, so you may see an uptick in my number of blog posts and infographics. I also started a Facebook page, which I encourage you to go "Like" and share. I also have a few pieces of brain-candy waiting to be read of the non-science variety. So much to do, so little time!! This is a cross post from my Facebook page, which I'm broadening here to include links and more information. Every few months, anti-GMO websites will publish a meme about the latest paper that has "detected GMO DNA in (insert an organism or fluid that will cause alarm here)". Yes, DNA from GMOs has been detected in goats, humans, blood, organs, colostrum, you name it. But that's not the whole story. Our DNA is packed away very neatly in the nucleus of our cells and is the "code of life". This cellular DNA is the blueprint for the proteins that are the building blocks of our cells. This is the DNA that gets replicated when our cells divide and is the DNA that gets inherited. In our blood vessels, there's another type of DNA known as cell-free DNA (cfDNA). 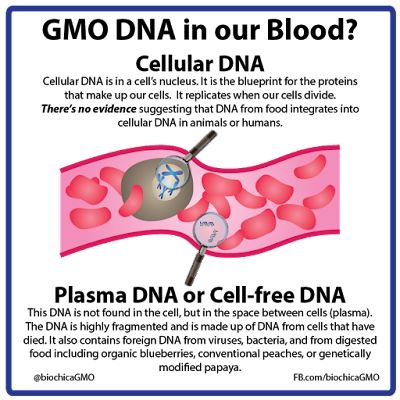 It's found in the plasma or the space between cells. It is made up of our DNA from cells that have died, but also foreign DNA including DNA of viruses and bacteria. In pregnant women, there's DNA from cells of the fetus, and this is the material that is used as the basis for non-invasive prenatal screens which allow to test the fetus for Trisomy-21 and other genomic conditions. Finally, there's DNA from the cells of food we've digested. Cell-free DNA is thought to be very short and degraded. When a GMO feeding test is carried out, it is not uncommon to check to see if the animals fed GMOs have segments of DNA from the food in their blood/tissues. The standard test that is used (PCR) does not distinguish between cellular DNA and cfDNA. This is because the PCR assay requires that you know what to test for, so we can only test whether the transgene is present or not in our sample, whether it's in cellular DNA or cfDNA. To determine if it's integrated into the cell's DNA (i.e horizontal gene transfer), you'd have to know where it's integrated into the genome in the cell's DNA and design the assay with that information in hand. The other option is to look at all the DNA in the cell (i.e. sequence the entire genome) and look to see if DNA from our food has integrated into our genomes. To date, there's no evidence suggested that DNA from our food gets integrated into cellular DNA. If DNA from our food did integrate into our DNA, then we should see these random DNA snippets in our DNA. However, in the thousands of human genomes that have been sequenced to date, this has never been observed. In the thousands of genomes that we've sequenced, from humans and other species, we have observed that DNA from other species get integrated into cellular DNA (horizontal gene transfer), but it is usually done by a virus or other microorganism. This article outlines how the sweet potato is a "natural GMO" because thousands of years ago, DNA got integrated into its genome using the same method that scientists use today to make GMOs. The fact of the matter is that, from a biochemical perspective, DNA from GMOs is identical to DNA from any other organism. It's not toxic, it's not different, it's made up of the same A, T, C, and G, as anything else. Our bodies cannot tell them apart. So DNA from our food has been floating in our plasma since we became a species and ate whatever plants and animals existed back then. I can say with quite a bit of certainty that there is DNA from tangerines currently floating in my bloodstream. I think I've eaten about 5 today. When the spouse read this post, he commented that "eating Yoda wouldn't increase your midichlorian count and make you a Jedi". I think a more apt analogy is "eating plants and veggies doesn't make you an Ent". If you want to learn more about GMO DNA and some of the papers I've reviewed/rebutted on the topic, please see here and here. Why aren't GMOs tested on humans?